Imperial Oak Plywood Library Paneling - 4' x 8'. This is a laminated panel requiring no additional finishing. Laminated plywood paneling has a high resolution photograph imprinted on quality paper that is then laminated to the plywood core using pressure, heat and adhesives in our manufacturing process. Curbside delivery to easily accessible addresses is included in our price. Imperial Oak library paneling consists of flat 4' x 8' panels with no grooves. Library Panels may be used in many ways and look great when combined with matching beaded paneling. This wall paneling is versatile and has been used in commercial projects. 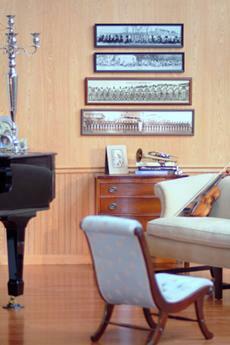 Library paneling shown here on wall above wainscoting height paneling with a chair rail. Click the button below to add the Imperial Oak Library Paneling to your wish list.